HASAAG is an offshoot of The Heritage Homes Orphanage founded in 2006 by Pastor Ituah Ighodalo. Last year, we held our first annual conference with Her Excellency Dolapo Osinbajo as the special guest of honor. On Thursday, November 15th, 2018, (World Adoption Day), we will be holding our 2nd Annual Conference with His Excellency, Professor Yemi Osinbajo (SAN, GCON) Vice President, the Federal Republic of Nigeria as Special Guest of Honour. The vision of the organization is simply to change the negative perception towards adoption in our society and render support to prospective adopters, adoptive parents, and adoptees. The issue of infertility in our society is a very serious one as it affects about 25% of married couples in Nigeria. Also, about 40-45 percent of all consultations in gynecological clinics are infertility-related according to medicalworldnigeria.com. Although male infertility has been found to be the cause of failure to conceive in about 50% of the cases, the social burden “falls disproportionately on women,” who suffer discrimination, stigma, and ostracism according to a WHO report on Sub-Saharan Africa. While some infertile couples will respond to different types of fertility treatments, some sadly will not. This is usually a very difficult position for them to accept. Fortunately though for such couples, adoption offers them the opportunity to have children. However, because of the stigma and shame associated with adoption, it is usually shrouded in much secrecy. It is this stigma and shame that we seek to fight by enlightening people appropriately on the subject of adoption. The shaming and stigmatization of women struggling with infertility in our society must be discouraged. Adoption should be encouraged as a legitimate way of having and, or increasing one’s family. The adoption process and procedure should be uniform and more clearly defined throughout the nation. Click here to register. Save the date! Hey Buddy!, I found this information for you: "Yemi Osinbajo to attend the 2nd Annual HASAAG Conference in Celebration of World Adoption Day | November 15th". 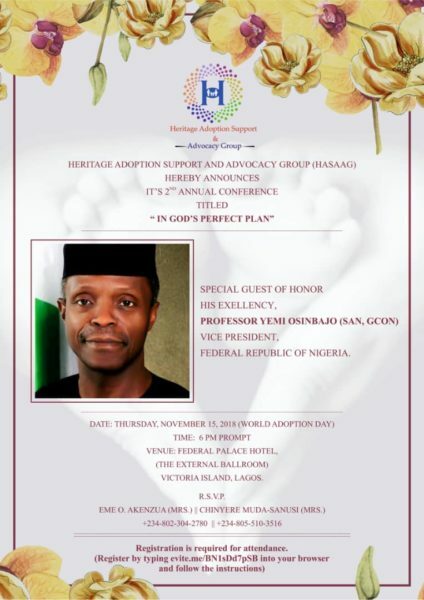 Here is the website link: https://headlinenews365.com/yemi-osinbajo-to-attend-the-2nd-annual-hasaag-conference-in-celebration-of-world-adoption-day-november-15th/. Thank you.